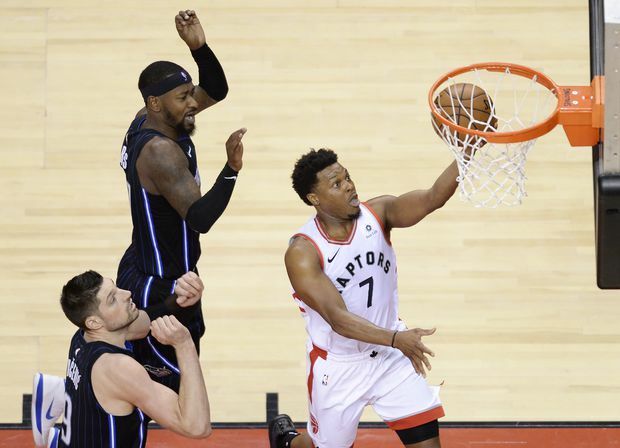 Toronto Raptors guard Kyle Lowry (7) scores past Orlando Magic center Nikola Vucevic (9) and guard Terrence Ross (31) during second half NBA playoff basketball action in Toronto, on Tuesday, April 16, 2019. The previous time Kyle Lowry started a playoff series on his back – in 2017 against the Milwaukee Bucks – he didn’t handle it well. Lowry scored four points. The Raptors lost. Afterward, he blamed the game-planning, rubbished his teammates and cursed his own luck. After a little consideration, he decided the best course of action was building his own cross and climbing up on it. “I guess I’m going to have force shots,” Lowry said peevishly. The important part – he was a lot better the next time out, and Toronto won. Lowry was badly below par in this year’s playoff opener. However, he was less surly in the aftermath. He didn’t spread around blame. He didn’t promise anything. This is the new Lowry, the middle-aged statesman. Ironically, pooching Game 1 gave him a chance to show it off. On Tuesday night, he scored his first point of the series within 90 seconds of tip-off. On a free throw. After missing the first of two. With the crowd on its feet, making as much noise as it had all series. One supposes the cheering was meant to seem supportive. Instead, it came off as patronizing and extremely Toronto. When Lowry planted a three a few minutes later, the reaction was more spontaneous. Things had returned to normal between Lowry and his fans – they love and mistrust him; he lives by the Marv Levy line about how listening to fans leads to becoming one. Afterward, Lowry had a man-of-the-match stat line: 22 points, seven assists. “Made some shots,” Lowry said, then let the silence hang there for a long minute. This man may enjoy himself more in a news conference than he does on the court. The best player on the evening was Kawhi Leonard. There have been only a few, sporadic opportunities this year to see what Toronto got when it traded for a single year of Leonard’s services. Now that everyone is paying attention, Leonard (37 points) decided to demonstrate it. When the mood takes him, he can do what he likes out there. So good news – this series has returned to normal operating service. It’s Orlando’s role to be plucky, and Toronto’s role to punish it. From the tip, this one was headed in one direction. Toronto’s defence showed up. The offence sprung fewer leaks. The result was a 111-82 drubbing, largest margin of victory in Toronto’s post-season history. Despite the result, there is still room for improvement. Danny Green was a nonfactor offensively. Marc Gasol was so-so. The bench didn’t do much, though it wasn’t asked to. The Raptors’ playoff ceiling is still several feet above their collective heads. But Toronto’s divining rod was, is and (until he either leaves of his own accord or is disinvited) will always be Lowry. Even with Leonard on hand, where Lowry goes, the Raptors seem to follow. Precisely no one will be surprised that after two days of steady mockery, Lowry did his whirling-dervish act – a lot of shrieking, spinning and flailing about the court. Lowry has many skills, and none so well developed as the shoving of words down throats. That’s the most charming part of Lowry’s brilliance – his ability to divide people. Nurse also wandered off onto a thought train that quickly derailed. Such as? Hold him around the waist and push up while he takes his jump shot? This is martyr-ism, which has been a long running theme in this city and has never once helped. Lowry’s poor sense of occasion is on Lowry. That’s why he gets paid so much. In Toronto, Lowry has averaged one truly gruesome offensive performance in each post-season. Last year, it was a five-point outing against Cleveland during the white-flag game that ended the series. It was Lowry’s tendency to trade these high-profile stinkers with DeMar DeRozan at precisely the wrong moment that amplified their perceived awfulness. He’s actually an okay playoff performer. Not a great one, mind you. Great ones win. But far less terrible than his reputation. At the outset of the playoffs, everyone made a great point of reclarifying Lowry’s new position on this team. He is no longer a star performer. He’s the conductor. His new personal theme is “toughness and leadership.” You can use quotes there because the formulation never changes, regardless of who’s speaking. The coach, the player, his teammates. Everyone has received the same talking points. The unspoken part of that is that Lowry is no longer expected to score. (Though he is expected to score more than zero.) Leonard handles that duty. Pascal Siakam, Gasol and Serge Ibaka also pitch in. Thirteen years into his NBA career, on a team freighted with potential, Lowry has become a glue guy. People ought to prepare themselves for a few more 3-for-7 sorts of nights during this run. It’s unorthodox. But Lowry’s set it up so that, if the team wins, it was his decision to change. If they lose, it was the coach’s fault. That sort of defensive coverage already shows pretty elite leadership on Lowry’s part. The toughness bit will be motivating himself for more performances like Tuesday’s once people start telling him he’s the greatest again.